Long a staple benefit for state and local government employees, defined benefit pension plans guarantee a fixed retirement benefit to the employee for life (and often extending to a spouse after the employee’s death). These types of plans have frequently been part of the attraction of government jobs in the United States, helping them compete with corporate and business positions that typically offer defined contribution plans, such as 401(k) plans. But changes to the accounting standards by the Governmental Accounting Standards Board (GASB) have led to greater scrutiny of defined benefit plans and could affect how they’re funded and managed. In 2012, the GASB issued Statement No. 68, Accounting and Financial Reporting for Pensions, requiring state and local government employers to change how they account for the defined benefit pension plans they sponsor. The updated standard went into effect in 2015. Its two biggest areas of impact deal with the discount rate and recognizing the net pension liability on the balance sheet. The discount rate is the expected rate of return on pension fund investments. The new standard requires significantly underfunded plans to use a lower assumed rate of return, thereby making the estimate of their net pension liability larger. Putting the net liability on the books rather than only disclosing it has drawn greater attention to public pension plans. The result is greater transparency, shedding light on the fiscal health and funding status of public pension funds in the U.S. This increased awareness of large pension liabilities has prompted policymakers to consider changes to defined benefit plans that could greatly impact both current and future retirees because they need to better plan for changes in benefits provided to plan participants. Accounting and finance professionals, as well as retirees, need to be prepared for this transformation of the retirement system. The funding gap between net assets and pension liability reached a record $1.4 trillion for 2016, the most recent year data is available. That total is up $262 million from the previous year—a 24% increase. This was caused in large part by the difference in the average expected rate of return (or the discount rate) of 7.5% and the average actual return of 3.6% for state and local pension plans. In addition, the funded ratio, which is the amount of pension assets divided by the pension liability, continues to shrink. It went from 72% in 2015 to 66% in 2016. If pensions were to use a rate closer to the risk-free rate, typically around 4%, then the funded percentage would drop from 66% to less than 50%. 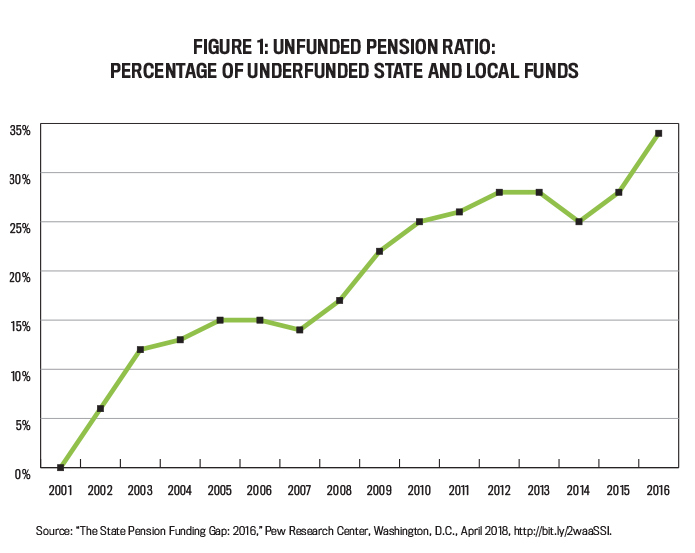 Figure 1 displays the unfunded ratio for state and local government pension plans from 2001 to 2016. Not only does it show that the number of underfunded plans continues to rise, but it also highlights their vulnerability to economic downturns. The two large spikes—a 12% spike from 2001 to 2003 and an 11% rise from 2007 to 2010—occurred during economic recessions. In both cases, pension funds collectively never fully recovered. Many state pension funds, which make up the majority of public-sector pension assets, suffer from dramatic underfunding. Figure 2 illustrates the funded ratio by state. The federal government considers a funding level of 80% (i.e., 20% unfunded) as a healthy percentage in the corporate world. Going by that barometer, only 12 states have a healthy level of funding. In addition, funded levels decreased in all but four states (Kansas, Michigan, Wisconsin, and Wyoming) from fiscal year 2015 to 2016, in large part due to some states adopting a lower discount rate. For example, Minnesota’s funded ratio dropped by nearly 30% due to the adoption of a 4.17% GASB single discount rate compared to 7.9% the previous year. 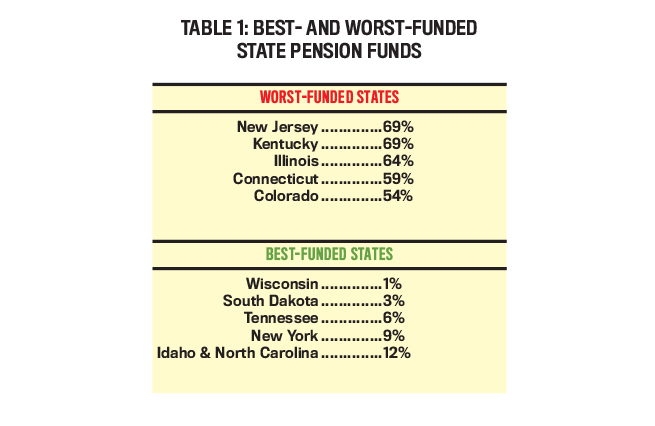 Even using the most liberal definitions of whether a pension is sufficiently funded or not, most states appear to have troubles (see Table 2). The generally accepted definition of underfunded has been the difference between a pension’s liabilities and assets using an estimated discount rate. But a Hoover Institution Study using different market valuation methods to assess pension funding levels estimates the total amount that public-defined benefit pensions are underfunded is $3.8 trillion, nearly three times the $1.4 trillion figure in the Pew Charitable Trust Data. The Hoover study contends that using the 7.6% discount rate implies that state and local government pension assets are expected to double every 9.5 years, which is unrealistic. Instead, it applies a plan-by-plan correction using a weighted average 2.77% rate rather than the 7.6% rate. Under this methodology, state and local governments would then need to increase their current annual contributions to pension funds from $111 billion to $289 billion just to keep the underfunded deficit steady—and that’s without closing the funding gap. That would equal 18.2% of all state and local government tax revenue. Not all the research and thought leadership supports the premise of an underfunding crisis or even the notion that public pension plans are underfunded at all. The argument against underfunding centers around payments in the distant future not equating to a financial problem today. An employee with funds in a pension program may not start collecting them for 10 or 20 years in the future and then doesn’t collect the full amount at that time but rather over another 20 or 30 years. It can be argued that underfunding doesn’t necessarily equal financial distress because the guiding principle of governmental operations is based on a cash basis, not an accrual system. The emphasis is on the ability to meet the current payment of obligations within a fiscal year, which all the pension funds continue to do. A primary example is Illinois pension plans, which have been underfunded for a century. Though they are among the worst funded in the U.S., they haven’t missed a payment yet. Even if some consider the pension crisis a myth, change is occurring. Government officials have been using the funding ratio as a justification for pension reform, and they’ve been able to do so with little public backlash. Many taxpayers don’t enjoy the retirement security provided by defined benefit plans, and some are critical of public employees who can retire and collect benefits at relatively young ages. For example, employees in more than half the states can retire and collect full benefits at age 55 or younger with 25 years of service—many of whom go on to another career or even get rehired by the same employer. This “double dipping” fuels the fire for tightening up these plans. For the most part, the GASB’s changes in its guidance for pension accounting and disclosure have been looked upon as an improvement, providing more information for legislators to make decisions. Yet the GASB’s pursuit to encourage public pensions to improve their accounting and financial reporting also could be creating incentives that impact management and policy. Managers could be enticed to put funds into riskier investments to achieve a discount rate that would yield higher funding percentages. Policymakers could also make plan changes or cut benefits unnecessarily. Politicians, the public, and the media have declared a crisis based on the definition of full funding—even with the skepticism from some areas. The new focus on pension funding brought about in large part by GASB No. 68 has made a significant impact on decisions that have diminished the institution of defined benefit plans. Nearly every state has made changes to increase contributions or decrease benefits. Pension plans across the country have made significant changes to cost of living adjustments (COLAs), the number of years worked required to become eligible for retirement, increased contributions, and direct benefit reductions. Georgia, Rhode Island, Tennessee, Utah, and Virginia have even begun moving away from defined benefit plans toward hybrid plans for new employees, with Rhode Island transferring current employees’ retirement assets. In 2017, Pennsylvania became the latest state to move to a hybrid plan by enacting legislation that will go into effect in 2019. The Texas State Legislature has taken action to remedy the Dallas police and fire pension funds’ $7 billion shortfall that can be attributed to poor investments in real estate. In Detroit, retirees and unions took the city to court and lost, eliminating COLAs and cutting their pension payouts by 4.5% across the board. The Illinois State House is attempting to address a $130 million shortfall. Kentucky is having similar debates, as a legislative committee has sent a $3.3 billion bond bailout package that the Senate is considering. A great deal of public debate continues in California as it deals with a $170 million shortfall. Stanford University recently released an in-depth study going back 10 years and projecting pension costs to the year 2030, showing that California’s pension woes will worsen. And New Jersey is making benefit cuts and increasing taxes to tackle its $135 billion unfunded pension liability. Many pension funds have moved assets into riskier investments, thereby increasing expected return and funded ratios. 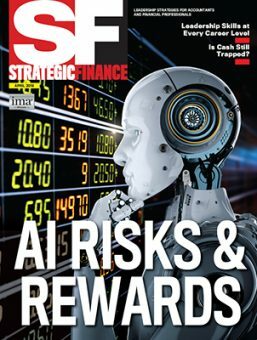 Whether it’s due to the necessity of bringing in higher returns to meet growing liabilities or the fact that safer investments, such as state investment trusts, bonds, and treasuries rates, are hovering around record lows, many defined benefit pensions’ investment committees have shifted to a risk-on mentality. In the early 1950s, 96% of pension funds’ investments were in bonds and cash equivalents. By 2016, that number had dropped to 27%. The only way to reverse this trend toward riskier investments is to lower discount rates. For pension plans that don’t do this, managers will be forced to continue on the path toward risk, which brings with it volatility. Yes, there are higher highs, but with the big increase in investments in equities, the lower lows pose a real threat. The volatility associated with investing in areas such as equities and real estate or in alternative investments such as private equity, hedge funds, and commodities brings real danger to the table. 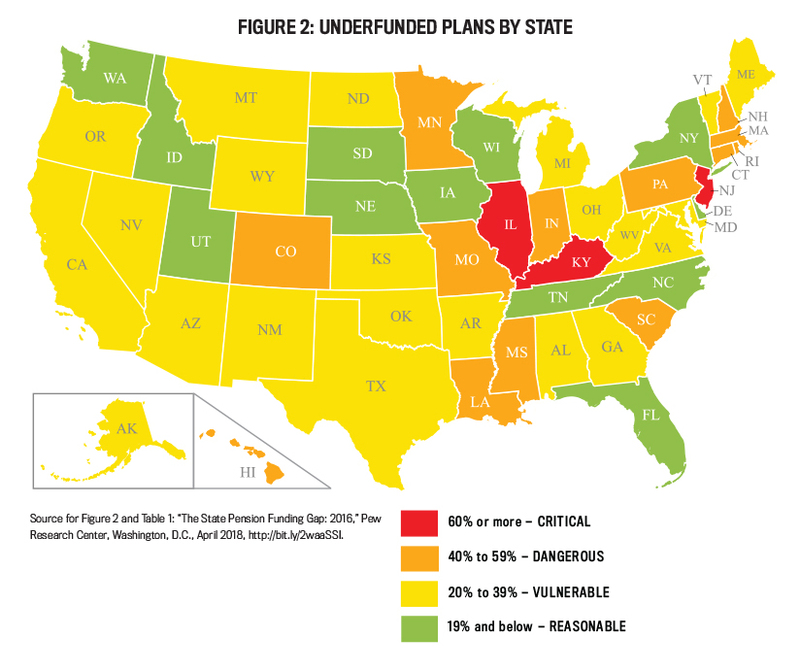 Underfunded plans may be the most at risk as they seek to make up their funding shortfall with riskier investments. Yet by making some relatively straightforward moves, these plans can greatly reduce risk and volatility. Adopting an investment policy, establishing time frames for setting discount rates, and establishing parameters for equities and other investments can greatly reduce risk. 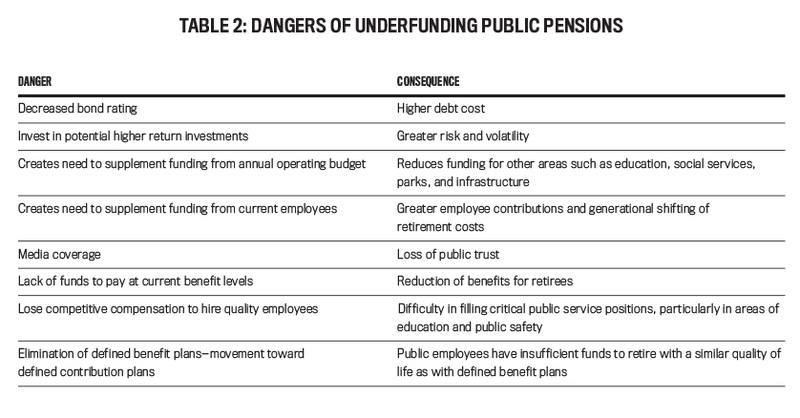 The consequences of pension underfunding extend beyond the plans (and recipients) to other public-service areas as well. Funding for parks and recreation, police and fire protection, healthcare, infrastructure, and other social services can be impacted by these shortfalls. For example, New York City is diverting larger portions of its operating budgets to pension systems. In addition, unfunded liabilities could lead to higher borrowing costs, which could inhibit borrowing for needed infrastructure, reduce public services, and negatively impact economic development. Even the most essential services such as education, fire, and police departments may be impacted by budget reductions. Further complicating the matter are Baby Boomers reaching retirement age. In the 1970s, average pension funds had many more active employees than retirees—but soon retirees will outnumber active workers. For several pension funds in places like New York City and Illinois, the retirees outnumber the current workers already. 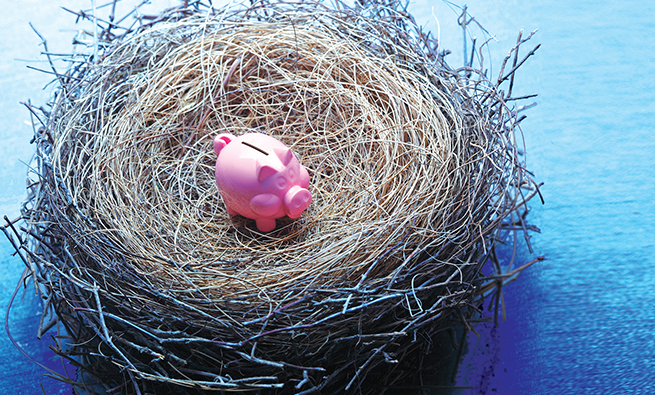 As Boomers retire, defined benefit pension payments will swell even further. Despite longer life expectancies and the trend in the private sector of employees working much longer, once employees with defined benefit plans are eligible to retire, the financial incentives to keep working don’t exist because they can collect the majority of their salary through their pension. In addition, replacing these workers may be an issue as U.S. birth rates continue to decline. Successfully addressing the many accounting and reporting aspects of state and local pension funds involves policy considerations and matters where management accountants can contribute at various levels. By becoming informed citizens and getting involved as community leaders and as contributors to identifying responsible actions, management accountants can influence public opinion and attitudes. The skills necessary to address pension reform exemplify the management accounting profession. For example, expertise in strategic planning, budgeting, forecasting, performance measurement, governance, and risk management are all necessary to address public pension plan challenges. Management accountants also can apply their data analytics, data visualization, and presentation skills to assessing public pension matters. 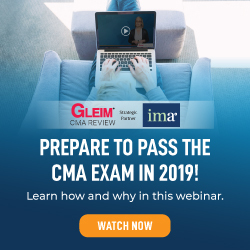 A specific area that the management accounting profession can help address is financial literacy, which is more important than ever with defined benefit plans under threat and defined contribution plans failing to live up to expectations. Young workers and those nearing retirement often aren’t financially literate and don’t understand their company’s retirement plans, which may require participants to pick their own investments. Defined contribution plans were supposed to replace defined benefit plans, but, on average, Americans with a 401(k) simply aren’t saving enough for retirement. By leading employers’ financial literacy efforts, management accountants can help others understand the best options for ensuring defined benefit pensions’ long-term sustainability or, barring that, help people with defined contribution plans to achieve better outcomes. While the level of state and local pension funding sufficiency is open to debate, the GASB pronouncements and increased transparency make clear the need for careful deliberation on potential solutions. While even the best efforts to close pensions’ funding gaps don’t guarantee a complete remedy, inaction is a poor choice. Management accountants and finance professionals should note what the GASB changes entail (see Table 3) and the discrepancies regarding the extent of the crisis. Regardless of the position one takes, realize that change is occurring and impacting current and future retirees in substantial ways. Management accountants’ participation and leadership in the progression of the transformation of the retirement space would assure a more informed process so that pension plan sponsors and legislators consider options such as defined contribution plans, amendments to COLA clauses, mandatory enrollment (as the State of California recently implemented), and other actions from a more fully informed perspective. The changes to pension benefits being made by state and local governments and plan sponsors can’t be ignored. Management accountants need to be on the front lines to deal with these changes, and current public employees must prepare better for the future. The employees at Cuyahoga Community College in Cleveland, Ohio, participate in the State of Ohio’s pension plans. Each governmental entity must report its share of the state’s liability related to current employees and existing retirees. The entity is ultimately responsible to make retirement payments should the state not have the ability to do so. Liabilities Impact Balance Sheet: Following the guidance in GASB No. 68, the college added to its balance sheet in fiscal year 2015 a liability of $132 million for the State Teachers’ Retirement System and $60 million for the Public Employees’ Retirement System. Communication and Understanding: Board members had great concern about the impact on the budget and future operations. The initial discussion involved the potential impact on operations and possible budget cuts. It took multiple committee and board meetings to eventually conclude that no board action was necessary and that, for the college, it was an accounting adjustment that won’t impact operations now or in the future. Credit Rating: The college went through credit rating affirmation with Moody’s and Standard & Poor’s. The board discussed the increased liability and even included it in each of its reports, yet it didn’t negatively impact the college’s credit rating. Lessons Learned: Sophisticated investors and ratings agencies have already incorporated the risk of pension liability for years, yet board members, policymakers, and the public have become genuinely alarmed by the inclusion of the liability on the balance sheet. Going forward, accounting professionals should be proactive in educating policymakers to ensure that they make appropriate decisions and that unnecessary or counterproductive changes don’t occur. Dissemination of knowledge on appropriate discount rates, investment policy, and an agreed-upon definition of fully funded are critically important. Craig Foltin, CPA, DBA, is an assistant professor of accounting in the Monte Ahuja College of Business at Cleveland State University. He is also the former provost, executive vice president, and chief academic officer of Cuyahoga Community College (Tri-C) and the former mayor of Lorain, Ohio. He can be reached at l.foltin@csuohio.edu. Dale Flesher, CPA, CGFM, Ph.D., is a professor of accountancy, an associate dean, and the holder of the Roland & Sheryl Burns Chair in Accountancy at the University of Mississippi. He can be reached at acdlf@olemiss.edu. Gary Previts, CPA, Ph.D., is an E. Mandell de Windt Professor and a Distinguished University Professor at Case Western Reserve University. He can be reached at gjp@case.edu. Mary Stone, CPA, Ph.D., is the Hugh Culverhouse Endowed Chair and a professor at the University of Alabama. She can be reached at mstone@cba.ua.edu.